Two artists were asked to paint scenes of peace as they perceived it. The first artist painted a quiet, undisturbed lake nestled among snow-capped mountains. The second painted a raging waterfall crashing into the pools below. An unassuming birch tree extended over the crest of the waterfall and within it, a bird rested quietly in its nest. Peace does not exist without opposition. It cannot be present without the world’s resistance. While the first artist painted a beautiful picture, it is not representative of how peace appears in our lives. Real, lasting peace must operate within and in spite of the storms of our lives. The circumstances and problems of the world may crash around us, but our peace abides inside. A calm mind and a faithful heart can find peace in every moment. Don’t wish for life’s storms to subside. Instead, pray for peace to endure whatever comes your way. Resist the urge to hide from adversity. Instead, pray for the strength to overcome the challenges within your journey. Refuse to worry. Instead, have faith that you are right where you are meant to be. Peace’s serene yet vibrant beauty is reflective of how it appears in our lives. If you are experiencing resistance or opposition in your life, there are also abundant opportunities to feel peace. 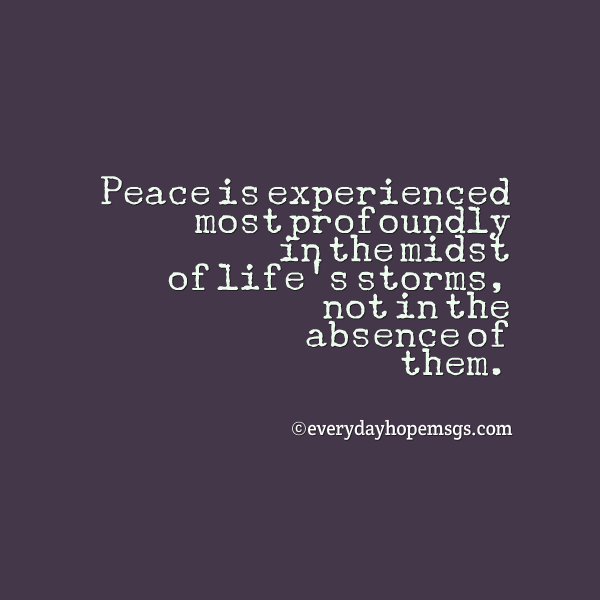 Choose peace, for it is experienced most profoundly in the midst of life’s storms, not in the absence of them.